The IPBS international strategy aims to reinforce cooperation, to increase the IPBS international visibility and attractiveness but also to heighten IPBS participation to the European Horizon2020 research and innovation framework. This strategy for the development and structuration of the IPBS international cooperation is driven by Dr. Isabelle Saves, head of the international Cooperation office. It is conducted in direct interaction with the Direction for European and International Research Cooperation and the Partnerships and Valorisation Office of the CNRS and in line with both the University of Toulouse and the Region Occitanie policy. The feeding of IPBS international network of research institutions also implies the Campus France Agency and the French and foreign diplomatic networks and the organization of visiting delegations. Notably, the incentive and support work carried out over the past two years has already resulted in very positive results, such as the awarding of the very first ERC Starting Grant at IPBS to Dr. Etienne Meunier, an ERA-NET funding on Antimicrobial resistance and a MRSEI ANR grant allowing the IPBS to constitute and coordinate an European consortium including 15 partners from both the academic and private sectors, the establishment of one LIA with a co-tutelle PhD, the recruitment of four Marie Sklodowska Curie Action (MSCA) or MSCA/Respire Foundation fellows, and the strong increase of researchers’ mobility. The IPBS has been involved in many research networks under the European Commission’s Framework s, from the Fifth Framework Programme for research, technological development and demonstration activities (FP5) to Horizon 2020 projects. These networks involve several teams from the TB & Infection Biology department, who are participating in European integrated projects fighting tuberculosis, particularly in some projects coordinated by the "Tuberculosis Vaccine Initiative", but also involve teams from the Cancer Biology department and Structural Biology & Biophysics department. Since 2000, the TB & Infection Biology department of IPBS is part of the TBVAC Consortium. This consortium brings in a large number of key partners from excellent laboratories from Europe, but also USA, Asia, Africa and Australia, many of which are global leaders in the field of tuberculosis. Scientists and developers from 40 research partners collaborate in TBVAC2020. The cuurrent 4-year project started in January 2015 and is coordinated by the Tuberculosis Vaccine Initiative (TBVI). Based on a solid and old collaboration with the University of Ljubljana, the IPBS developed an European Associated Laboratory (LEA) entitled “Pulsed Electric Fields Applications in Biology and Medicine”, abbreviated as “LEA EBAM”. This French-Slovenian “without walls” laboratory has been created in January 2011 for four years and has been renewed for four additional years. IPBS teams are also members of European programs of cross-border cooperation, through the interregional (Spain-France-Andorra) POCTEFA 2014-2020 created to promote the sustainable development of the border territories of the three countries on both sides of the Pyrenees. Recently, an ERA-NET funding under the 6th « Joint Programming Initiative for Antimicrobial resistance » was allocated to a consortium including the IPBS and addressing bacterial persistence. 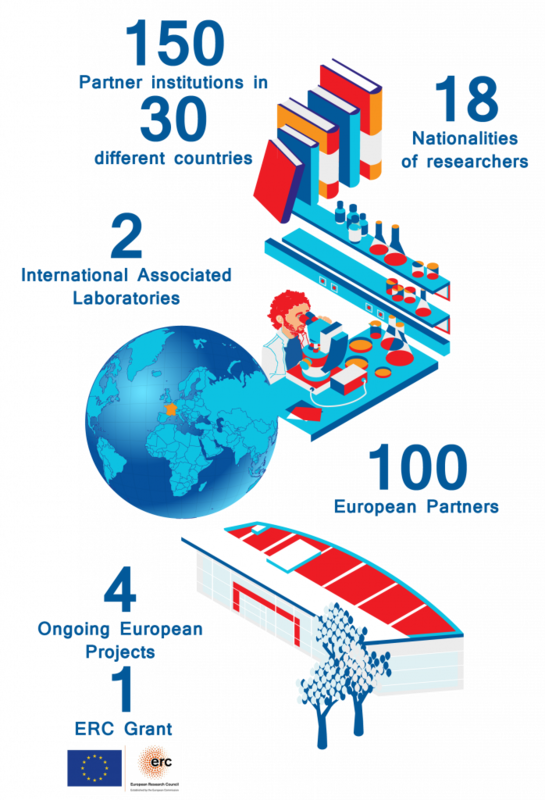 Historically, starting with the 5th European Framework Programme (FP5) in 2000, the IPBS takes part to the global initiative against tuberculosis as one key partner of the “TB Vaccine Cluster”. Between 2010 and 2014, the TB & Infection Biology department of IPBS had participated to the SYSTEMTB consortium, together with 12 renowned institutes such as the Max Planck (Germany), the medical research council (UK) etc. Between 2008 and 2012, Prof. Alain Milon, the NMR team leader, coordinated an Initial Training Network (ITN) on the theme of Structural Biology of Membrane Proteins (SBMPs). This network involved 13 academic teams in Europe, and allowed the funding of 21 PhD scholarships and 14 postdoctoral fellowships, including 3 in the IPBS. IPBS has also actively participated to the EU-Brazil project “TARKINAID” aimed at the understanding and treating Chronic autoimmune and inflammatory diseases such as rheumatoid arthritis or chronic inflammatory lung diseases. Joint research programs with research institutions around the world, in Asia (Taiwan and Japan) and North America (Canada and US) and South America (Brazil and Argentina), illustrate the international scope of the IPBS. The current policy of the IPBS is to increase its international cooperation through the strengthening of the framework for hosting foreign students and researchers, the participation to mobility programmes such as “Projets de Recherche Conjoints” (PRC) or “Programme Internationaux de Coopération Scientifique” (PICS) developed by the CNRS and “Partenariats Hubert Curien” (PHC) developed by the French Ministry of Foreign Affairs, but also the creation of International Associated Laboratory (LIA). To this end, particular effort is focused on finding fellowships and on funding researcher mobility, as well as on improving the international visibility and attractiveness of the Institute. To cite a few, international partnerships are currently supported by the ECOS-Sud exchange programme (Argentina), the “Centre Franco-Indien pour la Promotion de la Recherche Avancée” (CEFIPRA/IFCPAR), the Programme “Découverte Chine” and Chinese PhD students receive scholarships from the Chinese Scholarship Council (CSC).